I've just come home from a beautiful Christmas concert that my children’s music teacher organised at an old people's home in town. A group of thirty youngsters aged six to sixteen, including my own children, played Christmas carols and a few student pieces by Bach and Dvorak. I'm probably getting old and sentimental. I was so moved when the elderly began to sing along. I had to think of my granny, a sweet and pious Tibetan lady, who used to express her approval during Christmas. "Isn't it wonderful? Even they know Kunchog," she used to say. Music can do wonderful things to people but learning about its history and the lives of the people who created the music, can also be eye-opening. Some composers led hard lives, often hidden behind the "cultured", sophisticated urbane circles in which their music has been played. Bach, for example, who is revered like a demi-god, died a poor and unknown man. More than half of his twenty children died due to poor health and illness as did his first wife. For many years they all lived cramped in a small, unheated room with no sanitary facilities, all the while young Bach was compelled to turn out new church music on a weekly basis to go with the Sunday sermons to feed his family. His life-story is so rich in deprivations and yet his creations so heavenly that in part it reads like a miraculous hagiography of a holy Buddhist master. And perhaps some kind of saint he was who received revelations from music that were higher than anything received from wisdom or philosophy? Traditional Tibetan music is not as elaborate as Western classical music. I think that's realistic to say. Do you know of any famous Tibetan composers? Our musical heritage seems to be largely anonymous. But it has always been very much rooted in society. Tibetans have never been musically idle. In terms of religious music, there is the ritualised Cham dance performed by monks with instrumental accompaniment, there is the polyphone Gyuto Chant with its distinctive overtone singing. On important religious occasions, popular prayers are also offered in a communal spirit in the form of songs. Examples include "Calling The Lama From Afar" or Je Tsongkhapa's Migtsema. And "Dolma 21", the praise to Tara, "mother of all Buddhas", always reminds me of Ave Maria by Bach/Gounod. The texture of Tibetan religious music is simpler than the exquisitely embellished oratorios with chorals and highly-varied instrumental accompaniment of the Christian church. But undoubtedly there is something. Perhaps in terms of liturgy, Tibetan Buddhist chant is a bit similar to the medieval Gregorian chant which codified the sacred songs of the Roman Catholic Church. The Tibetan musical genre called Lhamo is the counterpart of Western opera. Members of the older generation like my Amala are still fascinated by it and can listen to it for days in a row. Melodies, which I find neither beautiful nor expressive, never fail to touch my mother. What is incomprehensible howling to my ears, is a crystal-clear message to her. Once at a Losar party, she volunteered a Tibetan aria and a Western musician who happened to be in attendance, told me afterwards that of all the songs we heard that day, none touched him as deeply as my mom's "namthar". If someone from a different culture finds a way to appreciate this archaic music, I for sure must find one too? As in Western opera, Lhamo plays are acted out on stage with a fully equipped orchestra and with singing actors. The vocal technique is very different and so are the musical instruments. In both cases however lyrical understanding is limited due to pitch. In the world of Tibetan opera, the famed castrati, who popularised opera in Europe, were nonexistent. And unlike in Chinese or Japanese opera, we don't see men acting in women's roles either. Lhamo is also traditionally performed on religious holidays out in the open, for free public enjoyment. Western operas on the other hand, were a privileged pastime of the aristocracy first and of a paying bourgeoisie later. In terms of storylines, Western operas became largely secular and their sometimes "decadent" topics in the style of the womanizing Don Giovanni were viewed with hostility by the church. Lhamo, in typical Tibetan fashion, stands completely in the service of religion: Whether it is the story of "Nangsa Wobum", the pious girl who wants to become a nun but is given away as a bride to a wicked family: the tale of the virtuous Dharmaraja "Prince Norsang", who subdues the evil kingdom in the north; or the well-known tale of the divine, deer-born "Sukyi Nyima", who suffers the travails of yet another cruel mother-in-law; the moral of these stories is always: a) Stick to the ethical path no matter how big the obstacles, and b) Bad guys are reformable because they too have Buddhanature. Tibetan opera thus has a positive healing message and a happy ending. Two other areas of music, where I feel Tibetans today are doing particularly well are in contemporary pop music and folk music. The pool of folk music is incredibly vast and regionally diverse. It serves as a reservoir of ideas for modern interpretations. Here themes, genres and singing-styles are highly varied: There are romantic songs, work songs, spiritual songs, farming songs, songs celebrating the land, nomad songs, songs of gratitude to one's parents, and of course plenty of drinking songs. As for the latter, I think the Irish can get ready for some serious competition from the red-faced Tibetans! Some folk tunes are so catchy they also charm international listeners. Many years ago, when asked to present a Tibetan song at his school, my then eight-year old brother, fresh and full-throated, sang "Pema Thang" for them, a traditional from Kongpo about the ritual hat of Guru Padmasambhava. Soon the whole class joined in the refrain bobbing up and down, "rog zer-na rog !" In Tibet, every region has its distinct music as I have written about before in Bashè Forever. Many of the regional songs also come with matching circle dances – "rondo alla tibetana" :--) or take the rare old mountain tunes, one earthier than the other: They seem to be an Eastern Tibetan specialty, yodelling Tibetan style. It is done with such fervor it moves the surrounding hills to tears together with all the people, sheep, and Shidag who live on them. Starting out low and slow, moving on to higher pitches with a gradual crescendo and ending with a shrill scream "keehee! ", these glu are the epitome of Tibetanness: Hearty, powerful, uncomplicated and free. The raw material, the wealth, the potential, is there. 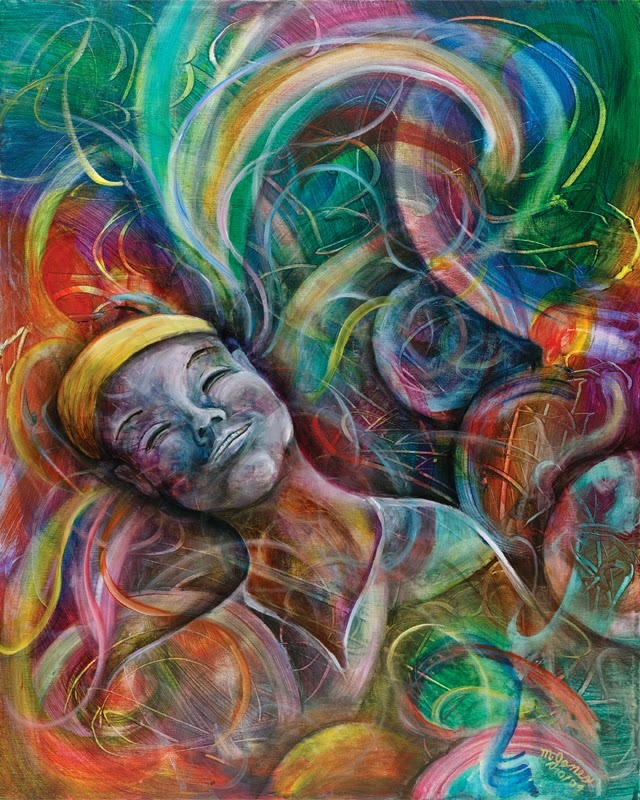 As a result, international musical collaborations have emerged with artists working together to produce new music incorporating their individual styles. So far they seem to focus on the meditative, spiritual aspect. What hasn't happened on a noticeable scale yet, perhaps for a lack of advocacy, is a meeting of Tibetan music with Western classical music. At a time when the Tibetan culture is under pressure from all sides, it may sound like a paradox if I say these are exciting times. But in my eyes it is not all doom and gloom. The difficult environment also holds a few opportunities that have never been there before. I for one was delighted to learn that the Tibetan capital now seems to have its own symphony orchestra. I am dying to hear them interpret works from the standard classical repertoire. How would Bach sound if played by Tibetan musicians? Or a more modernist composer like Bartok? How would they interpret the material? The other day on my way home from work I ran into my kids’ music teacher's husband, a professional oboist at the local symphony. We talked about music as a profession and the possibilities of employment in orchestras around the world. He said, with globalisation orchestras were becoming increasingly international and many cities now had excellent symphony orchestras. In the early days there were London, Paris and Vienna, he pointed out, but now there were great orchestras also in many other cities such as Sao Paolo, Oslo and Istanbul. When I said there is even a symphony orchestra in Lhasa, he retorted without the slightest surprise: "Of course, there is! We all feel the same!" I could have kissed him for saying that. Western classical music has the ability to touch the hearts of listeners around the globe. It was born and refined in Europe but it has travelled to other continents where new composers and musicians are born. Every culture has been able to recognise itself in the music and it is good to see that Tibet is no different. Although the country is struggling with so many existential problems there are also signs of a cultural reinvigoration, which makes us hopeful. Next time I make it to Lhasa, attending a concert by the Tibet Philharmonic Orchestra will figure at the top of my to-do list. I hope that one day it will not only be common for Tibetan children everywhere to be able to attend school but that many will also have the chance to learn a musical instrument. Don't Tibetans in general have something like a "biological advantage" in the field of music? Not one who can't sing or dance, especially if they grew up in Tibet proper. Tibetans are the Blacks of Asia. Rhythm is in their blood. I have seen adults who sing and dance at the push of a button - in front of complete strangers and without a hint of inhibition. Apparently the Chinese have a saying: "A Tibetan baby can sing before it can speak and dance before it can walk". Probably one of the more flattering things they have to say about Tibetans. And for once we are in agreement. A modern music education with its structured and focused training method, the enormous breadth and depth of compositions, combined with an elaborate notation system, would allow our people to channel their innate talent. Not only would they learn more about the world of music, it would also enable them to employ these new tools and impulses to work creatively with their own musical heritage and raise it to new heights without losing its unique character. Oh, how I would love to see that become reality! 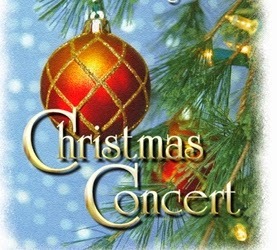 At the Christmas concert they also played Dvorak. This well-known composer fused elements from his native Czech folk music to write classical music pieces. He also wrote "American" classical music by studying the songs of the natives and Blacks and letting that inspire his creations. I am hopeful that one day a Tibetan Dvorak will be born and compose a grand "Tibetan Rhapsody" that captures the majesty and rugged beauty of the plateau. Listening to it will take us on a mental journey to the realm of the world's highest peaks, the source of Asia's biggest streams and the home of the Tibetan people who have managed to thrive in one of the harshest climates. 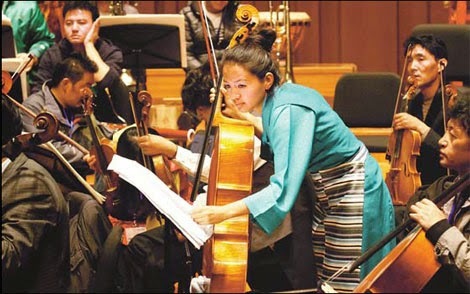 More Tibetan composers will follow and one day their works will also be played by symphony orchestras around the world. The idea of what could be, is pure music to my ears. And as a bonus, the efforts in the field of music will contribute to keeping the Tibetan culture alive as we move through time.